The French-Canadian media had packed up and shuffled out of the visiting team’s locker room after a 6-3 Golden Knights victory. There were only a few of us (local media) leftover when Montreal captain Max Pacioretty stood by his stall looking to chat. A few questions and three and a half minutes later, I knew I had a few gems. That quote ended up creating a bit of a storm back east as some Habs fans took offense to Pacioretty’s comments. The next day, sports talk radio hosts in Montreal were trying to calm down unreasonable fans. Realistically, the veteran NHL’er was being a good team ambassador praising the newest franchise. After another lopsided Montreal loss, I was shocked how open Pacioretty was, and I believed every word. It wasn’t lip-service. He really did enjoy playing at the T-Mobile Arena. 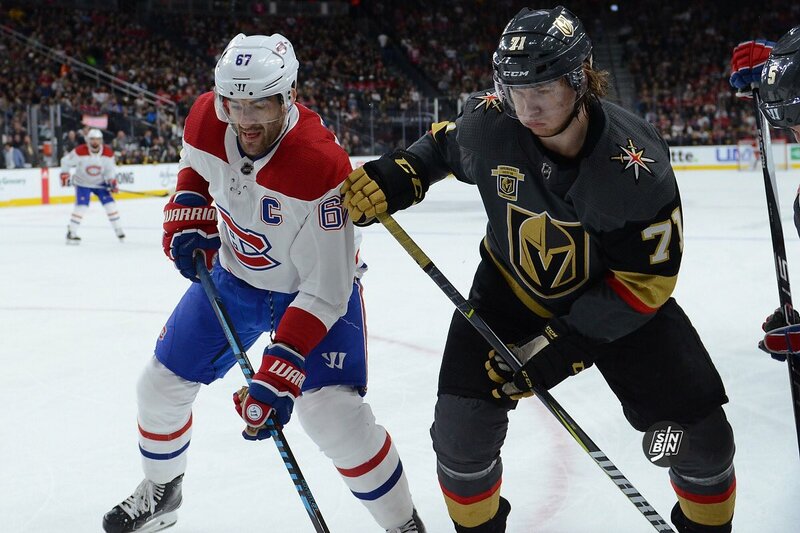 The music, the in-arena entertainment, the Las Vegas pageantry, Pacioretty loved it all. For one February night in Las Vegas, in the midst of a tumultuous season, the 29-year-old had fun just playing hockey. After that postgame exchange, I got the feeling Pacioretty would consider playing for the 31st franchise. On Wednesday, he essentially confirmed that. The veteran forward has played in traditional hockey markets his entire career, going back to high school. So to hear him speak about getting goosebumps in a “desert” market is an ironic jab to the hockey traditionalists. Pacioretty won’t have to imagine anymore. The Pacioretty acquisition should really encourage Golden Knights fans. More visiting stars will play here, fall in love, and want to sign with Vegas. #67 may be the beginning of a potential flow of future free agents. Everything I read about Pacioretty makes me excited. You can’t fake his enthusiasm. The season needs to start like yesterday. It feels super genuine talking to him in person too. He’s loving being here and fans are going to love this guy. The Pacific Division of going to be crazy this season. The LV-SJ matchups are going to be must see. As well most of the divisional games. They will be old time Patrick division crazy. Very intense and must wins. Only bad part for me, is the whole time zone thing. Now I’m just patiently waiting for his first big moment so Fanatics makes a cool signed picture to add to the collection. My signed photo collection is over 10 already haha but it’s so much fun. I could get his puck but I love the “moments” pictures for my gaming room.